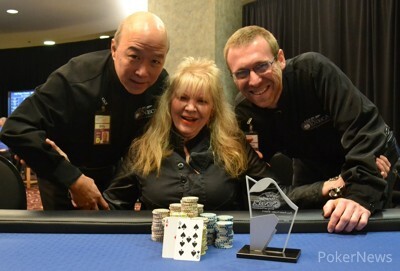 Barbara Rogers pulled off a win for the ages on Sunday night. Rodgers bested a field of 67 to win the final event of the Seneca Fall Poker classic and the $5,903 top prize. And she did it after having only 70,000 chips during heads-up player to her opponent's 1.2 million! Rogers battled back, eventually taking the chip lead and never looking back en route to the title. When we snapped her winner's photo she insisted that her dealers be included in the shot for helping her to the win. But Rogers has nobody to credit but herself for pulling off one of the biggest comebacks we've seen this year. Congrats to Barabara on her incredible victory! Event #5 attracted a total of 67 entries, and only 14 remain. Among those still alive include Alicia Pachla, Brett Short, Carol Leonardi, Barabara Rogers and Tom MacKinnon. The tournament is being played across the room from the Main Event so we'll do our best to provide a few updates from the final table. PokerNews has activated the MyStack App for Event #5 of the Seneca Fall Poker Classic, allowing you to directly adjust your chip counts in our live reporting blog using your iPhone or Android phone! Click here to download the My Stack app for iPhone, or click here to download the My Stack app for Android. Be forewarned, however, that any abuse of the app will result in account suspension or termination. We look forward to your updates! 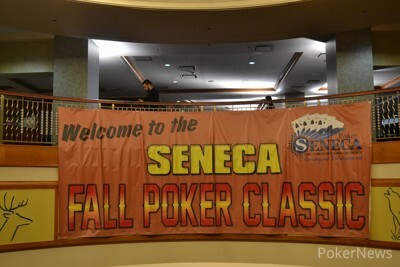 Welcome to Event #5 of the Seneca Fall Poker Classic! The final event of the 2014 Seneca Fall Poker Classic begins Sunday on the balcony of the Seneca Niagara Hotel and Casino. Event #5 is a $300 no-limit hold'em event which kicks off at 11 a.m. ET. Each player will receive 20,000 in chips and the blind levels will increase every 30 minutes. Registration and re-entries will remain open for the first six levels. This one-day tournament will end when a champion is crowned later this evening. Most of our focus will be on the Main Event today, but we'll be checking in here periodically to provide updated chip counts and highlights from the final table. 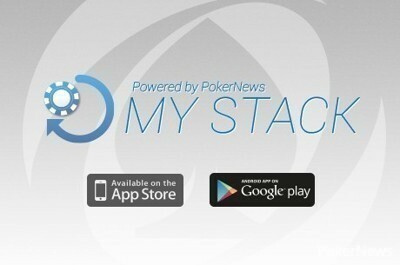 As always, the MyStack app will be activated for the tournament so be sure to update your chip stack from your mobile device throughout the day.